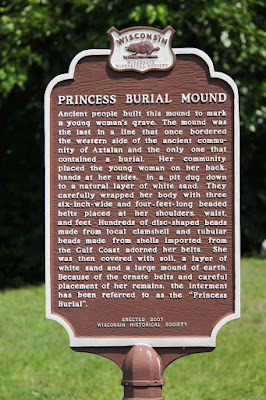 Ancient people built this mound to mark a young woman's grave. The mound was the last in a line that once bordered the western side of the ancient community of Aztalan and the only one that contained a burial. Her community placed the young woman on her back, hands at her sides, in a pit dug down to a natural layer of white sand. They carefully wrapped her body with three six-inch-wide and four-feet-long beaded belts placed at her shoulders, waist, and feet. Hundreds of disc-shaped beads made from local clamshell and tubular beads made from shells imported from the Gulf Coast adorned her belts. She was then covered with soil, a layer of white sand and a large mound of earth. Because of the ornate belts and careful placement of her remains, the interment has been referred to as the "Princess Burial". The marker is on the grounds of the Aztalan Museum, located at N6284 County Highway Q, at its intersection with County Highway B, Lake Mills, Wisconsin 53551. One of Aztalan's most famous and intriguing discoveries . . .
Wisconsin Natural Resources Magazine: Who were they are why did they leave? The marker and mound are behind the visitor's center. Another cool building, near the marker. The marker is located at the Lake Mills Aztalan Historic Society.